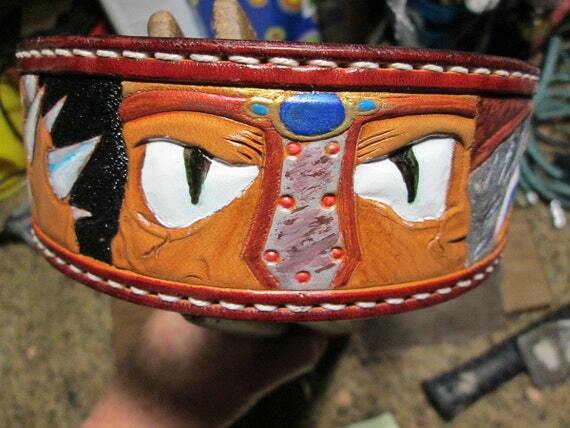 Tribal themed tooled leather dog collar. clean, fresh, secure,meticulously constructed dog collar. Collaborating a leather project with you is my favorite work/fun. You ever say, Ooooo I love that pattern but didn’t know how to get it on leather? A vision, a dream, a story through time, an event that you could never forget, a moment of being breathless…. Incorporating a voyage or journey into my pieces is the thinking here at this leather shop, Across Leather. 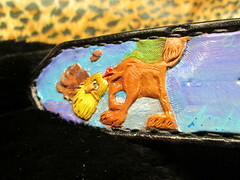 Dog collars seem to be my most rewarding work and a passion. To measure for your special one, utilizing a fabric tape measure neck area with the thinking of a possible new width. Lots of folks tend to go wider than standard store widths so at times your pet may wear his or her new collar at a slightly new location on their neck area. Measure adding a comfort zone in proximity of two fingers taking into consideration the size of your loved one. 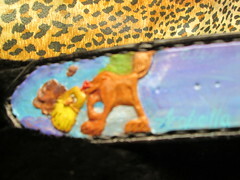 We’re still tweaking our latest addendum to our pet line”harnesses”, stay tuned! kangaroo lace wrapped collar. All colors applied then sprayed black then removed just enough to create something different.